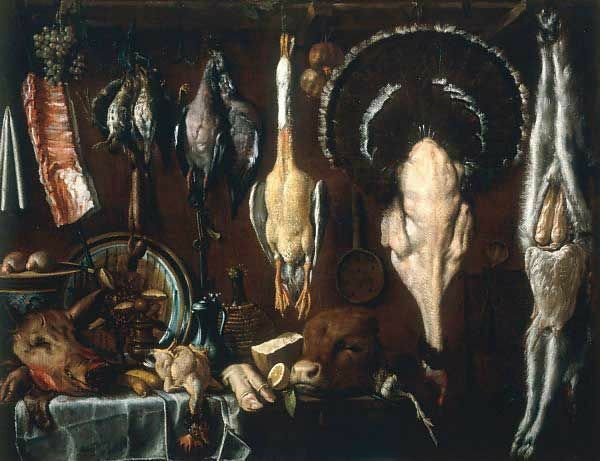 Dead ducks and such, painted by Jacopo da Emoli, 1551-1640. Have you tried buying a whole duck lately? I don’t know what’s going on, but the price is completely out of line. And I’m not talking Greenmarket, superorganic, locavore here, I’m speaking of the ducks I always used to pick up at a supermarket for, oh, a few dollars more than I’d pay for a good chicken. Now I’ve discovered that I’d be paying $34 for a measly little fatty bird. I find this outrageous. Why should it be? I got really, I must say, really mad when I saw it. But since I don’t stay mad for long, especially for a Sicilian, my eyes glanced over to the pre-cut duck breasts and legs. Reasonable. I can by a cut-up duck for a lot less than a whole one (of course not the same thing, culinarily speaking, but still). So I picked up a whole antibiotic-free duck breast, went home, bolted myself into my little kitchen, and came up with what I feel is a nice spring recipe. I hadn’t experienced the seared rare duck breast of 1980s restaurant menus for a long time, so I thought I’d give it a whirl again. It’s easy to do at home. And you don’t need to make it so ridiculously blood rare you need saber-toothed tiger fangs to eat it. Rosy pink is what I like. The trick to searing duck breast to pink perfection is to melt out the fat until the skin is crisp. Gently score the fatty side to help this process along. Then you’ll want to start the cooking with the duck breast fat side down, in a preheated skillet. You want to hear the sear. But watch what’s going on in the skillet, so the duck doesn’t burn before much of the fat has melted away. Just watch, and turn down the heat if necessary. It’s no big deal, but it’s essential. With a sharp knife, gently slice a few cuts into the fatty side of the duck breasts, without cutting into the meat. Then mix all the spices together, including the salt, and rub them all over the duck, getting some into the slits. Let sit unrefrigerated while you get on with the rest of it. Put the farro into a medium pot, and cover it with water by about 4 inches. Add a little salt, and bring it to a boil. Turn the heat down a bit, and let it bubble, uncovered, until the grains are just tender. Time can vary. The stuff I cooked up last night took only about 20 minutes, but I’ve had brands that have taken 30 minutes or longer, so just taste it from time to time. Add more hot water if it gets too low. Drain the farro, and put it in a bowl. Drizzle a thread of olive oil over it, and give it a toss. Put up a small pot of water, and bring it to a boil. Add one of the watercress bunches, and blanch it for about 30 seconds. Drain, and run under cold water to set its color. Then squeeze as much water out of it as you can. Put the blanched watercress in a food processor. Add a little salt, the pine nuts, and the sugar. Pulse a few times until it’s well chopped. Add about ¼ cup of olive oil, and process until the sauce is fairly smooth. Add the lemon juice, and pulse again. If the sauce is too thick (it should have some weight but still be pourable), add a little more olive oil. Pour the pesto into a small bowl. In a medium skillet, heat two tablespoons of olive oil over medium heat. Add the carrots, and let them soften. Add the scallions and the peas, and sauté a minute, adding salt and some black pepper. Add the chicken broth, and simmer, covered, until the peas are just tender, about 4 minutes. Add a bit more broth if it dries up (you should have a little liquid left in the skillet when the peas are tender). Add the farro and a generous drizzle of fresh olive oil, and mix well. Put a heavy-bottomed skillet on medium-high heat, and let it get good and hot. Add the duck breasts, fat side down, and sear until the skin is very brown and much of the fat has been released. Lower the heat if they’re browning too quickly. This should take about 5 minutes. Turn the breasts, and sear the other side, about another 3 minutes for medium rare. Pull the duck from the skillet, and let it rest about 3 minutes. Add about a tablespoon of the watercress pesto to the farro, and give it a stir. Check for seasoning. Spoon a good helping of the farro onto two dinner plates. Slice the duck thinly on an angle, and fan it out around the farro. 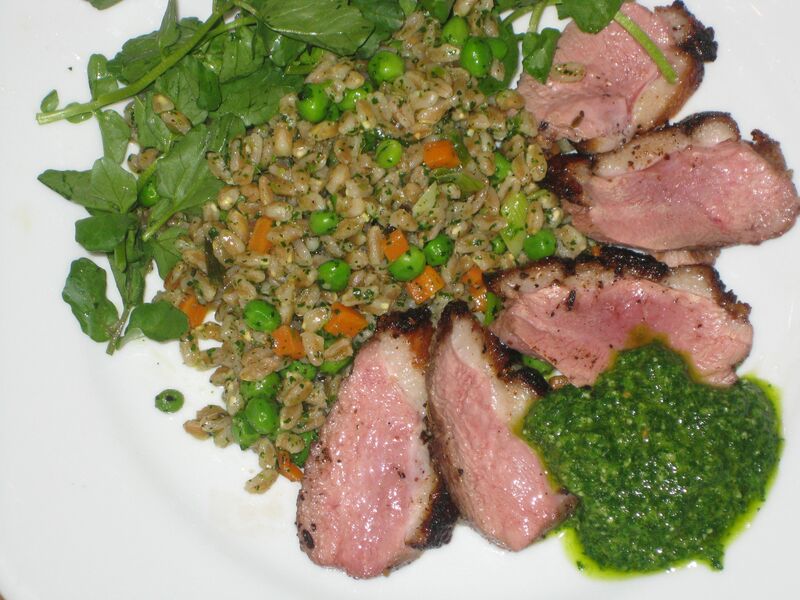 Decorate the plate with the fresh watercress, and spoon a generous amount of the watercress pesto near the duck. Serve right away. So I was looking on ly favorite food sites for a recipe for whole duck and found this article because you mention whole ducks. I had just purchased one at my asian market here in Philadelphia last night and was thinking about how to cook it. Sure enough, like father, like daughter – same asian markets, same fondness for duck, same taste in great food websites. What a great website bringing families together! Happy Thanksgiving to you and Dad.